It’s been rumored for years. 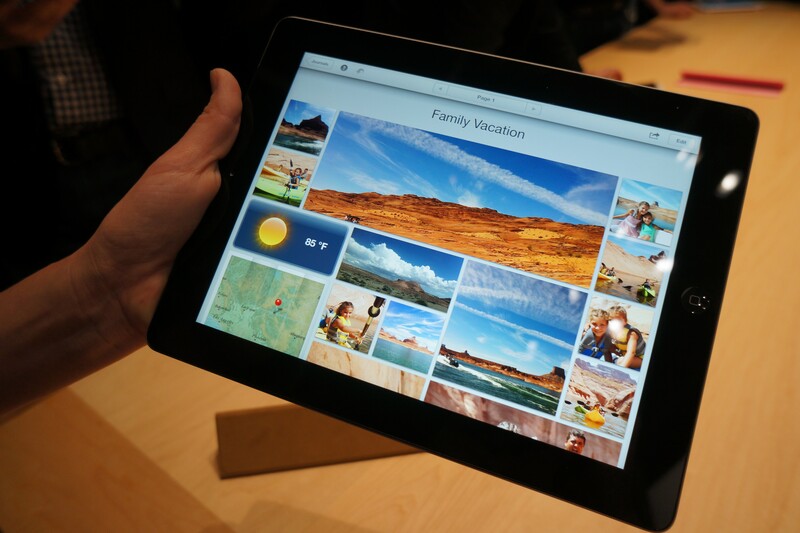 Is Apple(s AAPL) finally set to sell a smaller iPad? That’s what Bloomberg says it has heard from two different sources. Apple is planning to introduce an iPad with a screen measuring “7 inches to 8 inches diagonally, less than the current 9.7-inch version,” says the report published Tuesday. However, this iPad won’t have a Retina display, according to one of the sources. It could be introduced by the end of the year, possibly in October. It’s true that many in the tech world have been clamoring for a smaller iPad for years — my colleague Kevin Tofel, for instance. But it’s not necessarily clear how much profit Apple could squeeze from a device that would basically be hobbled with fewer features than its best-selling 9.7-inch tablet. Apple’s put a lot of money and energy into positioning the iPad’s huge, bright and crisp screen as essential for a tablet. Why go smaller and duller? Competition. The iPad has sold remarkably well as is. It is the only tablet of consequence on the market, two years after the debut of the original. And the introduction of its super high-definition Retina display from the iPhone to the iPad (and recently the MacBook Pro) is starting to convince people that a high-def display is a must have in all gadgets. A chief benefit of going smaller and with a non-Retina display would be to get the price down to a competitive level for that size device, somewhere around $200. It’s all tied to its competitors. The most compelling reason Apple has for going after the 7-inch category would be to stem any momentum from Google(s GOOG) with its brand new Nexus 7 tablet and Microsoft’s(s MSFT) new Surface, before either manages to get any. Amazon’s(s AMZN) Kindle Fire, a 7-inch e-reader tablet, hasn’t been able to steal many sales from the iPad despite its smaller size. But perhaps this is a sign that Apple is taking the Nexus 7 and the Surface seriously. So seriously in fact, that it could be willing to lose potential profits — they won’t make the same margin on a $200 device as a $400 — just to guard its market share. Apple cares a lot about profit, but it also doesn’t want to lose its dominant grip on a market it largely created. As Steve Jobs once explained about the iPhone: “I think we have to be the best, and I think we have to not leave a price umbrella underneath us.” He meant that when competitors figure out eventually how to mimic your product, you can’t let them undercut you on price, even if it means you end up introducing a new product with less than state-of-the-art features. In the case of the iPhone, it’s meant Apple has kept older model devices around and sold them either free with contract, or for $99 on contract. Apple has followed a similar pattern with the iPad, keeping older models on sale for $399, which is $100 cheaper than the least-expensive late-model iPad. But clearly Google and Amazon have figured out how to undercut Apple with a $200 tablet. Perhaps that philosophy about pricing and competition means that when it comes to tablets, Apple has decided that it needs to get smaller in order to get cheaper. Apple has the potential to really hit the market in education. As an educator of K-8 students I already see schools moving to using tablets in class. For those of you who aren’t aware, interactive white boards such as Smart Board are already being used in many classrooms and lessons are much more interactive than the past. Apple would do well to make a smaller iPad that could be used with interactive white boards, maybe even marketing a smaller iPad with their own brand of interactive white board. Schools can’t afford expensive full size iPads but they could afford a smaller version. Even $100 per tablet less makes a big difference budget-wise when buying technology in school districts. Have to disagree with you… there was nothing dull or unclear about early generation of iPhones or iPads… even before the Retina Displays. But, if there is an issue, it’s easily solved… a basic iPad mini for $250 and a Retina Display one the next year for the same price! Apple will clean Amazon and Google’s clocks! I still don’t believe this will be positioned as a “smaller iPad”. I think it will be a far more versatile, 7-inch (180mm x100mm) device — an iPod+ with a 16:9 aspect ratio — NOT a smaller iPad with a 4:3 aspect ratio. This mid-sized device would be a pocketable e-reader that still could be held with one hand, used for gaming and also fit in standard, Double-DIN automobile dashboard openings for a new generation of automotive head unit Apps that undoubtedly are coming. Best of all, it would breath new life into the flagging iPod product line. Whether its a rumor or not, Apples fighting for survival. Steve Jobs must be turning in his grave at what Apple has become. Log onto: http://www.abhirdayaram.com/technology/apples-fight-dominance-tablet-market-sign-concern/ and http://www.abhirdayaram.com/technology/apple-losing-samsung/ to see the true state of the company. The current iPad is too darn large to carry around. A version that would fit in one’s pocket is needed. How hard could that be to make with all the nanotechology and retina this or that available? What ever it will be, in my personal opinion I think it could make sense because it will give people more choice to stay within the apple eco system. A 7″ device is much more suited to kids and at a lower price more parents will be happy or rather afford to be able to buy one. On the flip side, stemming off interest in Nexus 7 would be an added bonus. Apple can get to use parts of the existing portfolio and supply chain too. Calling it a iPod touch 7″ as opposed to an iPad 7″ could avoid criticism but then what product name would have the best association? It will be interesting to see but so long as it doesn’t pull resources and focus from the larger iPad then it shouldn’t hurt apple. So while in the iPhone case they managed to compete with older models, they can’t do the same with iPad 2s at $249-$299 and iPad 3s at $399? I don’t understand where does this strange insistence, that Apple can only compete by making a 7″ device, comes from. A cheaper iPad would make much more sense for Apple, with existing ecosystems of optimized apps, than introduce a new form factor and adding more division in it’s App store. Would the customers opt for the Fire or Nexus 7 at $200 than going for iPad 2 at $249-$299? I highly doubt that. I don’t get Kirk Patrick’s reference to Apple PR. The Gigaom article does not quote Apple at all except for a general philosophical statement about price competition made over a year ago. The original Bloomberg article says Apple PR declined to say anything. There is no statement from Apple about smaller iPads — just anonymously sourced rumors. I see a distinct lack of spin here by Apple. Spin by Bloomberg and Gigaom, yeah. I wonder why everyone speculates Apple will bring out a smaller iPad. Perhaps they’re planning to bring out a bigger iPod Touch. So, basically, it’s still just rumor.